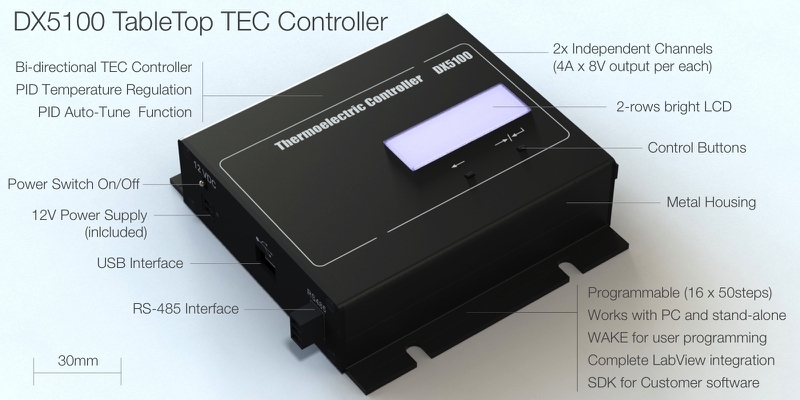 DX5100 TableTop Thermoelectric Controller is a precision-programmed device for all applications with TECs where accurate and precise temperature control is required. The device is made in all-in-one concept, providing all possible modes and regulation methods required for thermoelectric coolers. DX5100 TableTop is bi-directional (runs TECs in heating and cooling modes) with PID regulation and PID Auto-Tune function realized. DX5100 TableTop has two independent TEC control channels, with 4A x 8V (32W) output per each. It supports PTC and NTC temperature sensors with a list of most standard temperature sensor types already configured. Integrated function of TEC express testing is a key feature of DX5100 TableTop device. It has the express TEC testing function and may measure TEC AC Resistance, Figure-of-Merit (Z) and Time Constant parameters - key parameters for TEC conditions monitoring and performance level analysis.